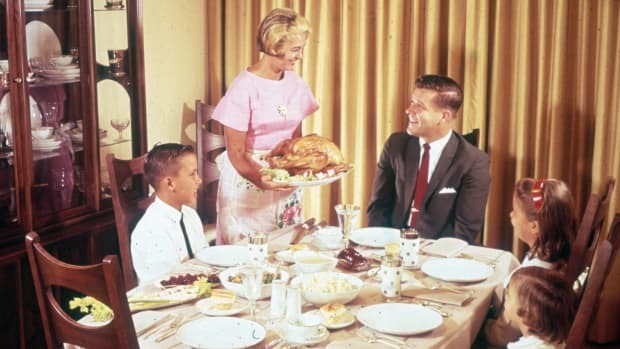 Did Florida Host the First Thanksgiving? More than 50 years before the Pilgrims landed in Plymouth, Spanish colonists in Florida feasted with Native Americans in what some call the first Thanksgiving. Blaring trumpets and thundering artillery serenaded Don Pedro Menéndez de Avilés as he waded ashore on September 8, 1565. 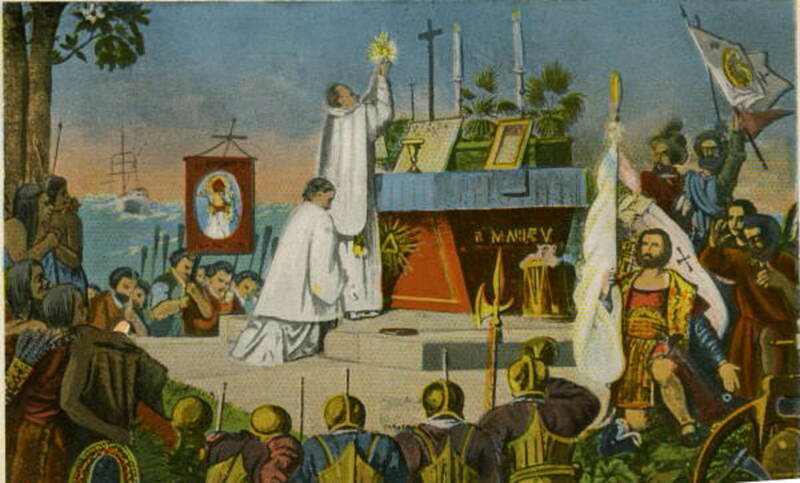 The Spanish admiral kissed a cross held aloft by the fleet’s captain, Father Francisco Lopez, then claimed Florida for both his God and his country. 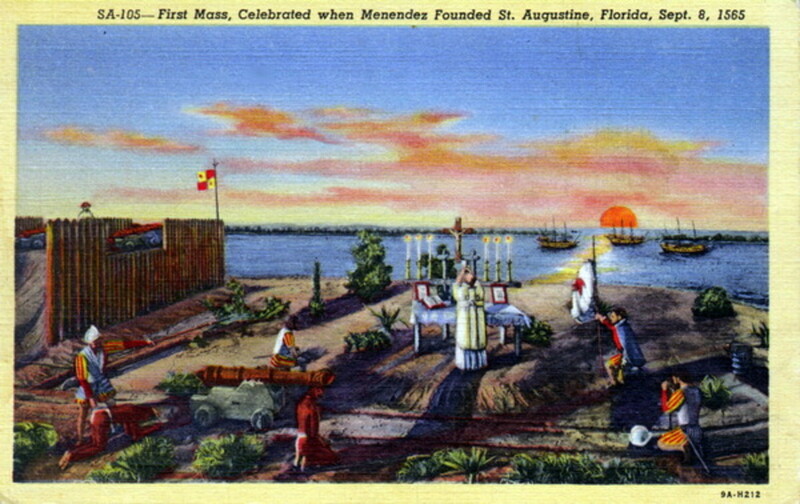 As curious members of the indigenous Timucua tribe looked on, the 800 newly arrived colonists gathered around a makeshift altar as Father Lopez performed a Catholic mass of thanksgiving for their safe arrival in the newly christened settlement of St. Augustine. At the invitation of Menéndez, the Timucuans then joined the newcomers in a communal meal. Celebration of mass on September 8, 1565. The menu for the meal shared by the Spaniards and Timucuans lacked most of today’s typical Thanksgiving dishes, but it did feature a traditional post-Thanksgiving staple—leftovers. Unlike the Pilgrims, who served food freshly harvested from American soil, the Spanish were forced to make do with whatever provisions survived the long voyage across the Atlantic Ocean. 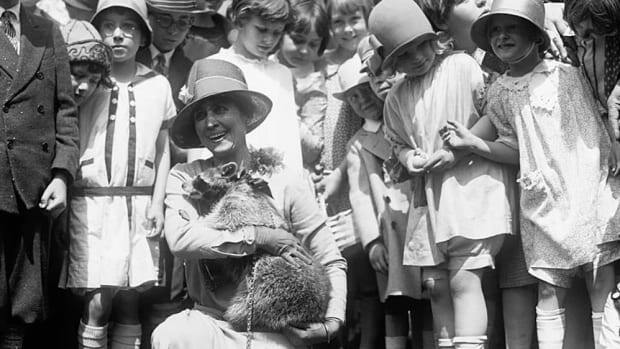 According to Robyn Gioia, author of the children’s book “America’s REAL First Thanksgiving,” the European colonists likely ate hard biscuits and cocido—a rich garbanzo stew made with pork, garlic, saffron, cabbage and onion—washed down with red wine. “The Timucua ate what was available to them locally and that could have included alligator, bear, wild turkey, venison, tortoise and food from the sea such as turtle, shark, mullet or sea catfish,” Gioia says. Archaeological research also shows the indigenous people ate large amounts of oysters and clams along with beans and squash. Celebration of mass in St. Augustine. 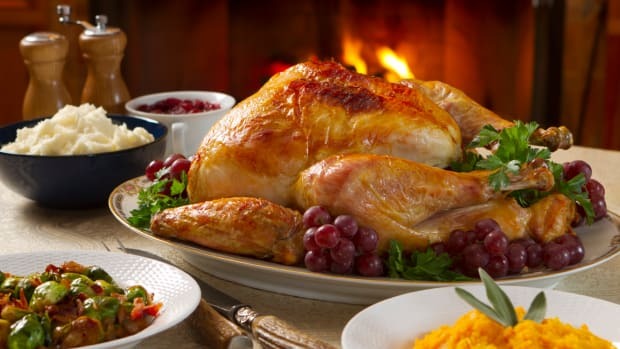 Some historians argue that while America’s first Thanksgiving indeed took place in Florida, it actually occurred 40 miles further north and one year earlier than the one in St. Augustine when French Huguenots—Calvinists like the Pilgrims—held a service of thanksgiving and feasted with the Timucuans to celebrate the June 1564 establishment of Fort Caroline along the St. John’s River in present-day Jacksonville. “We sang a psalm of Thanksgiving unto God, beseeching him that it would please his Grace to continue his accustomed goodness toward us,” French explorer Rene Goulaine de Laudonnière wrote in his journal. 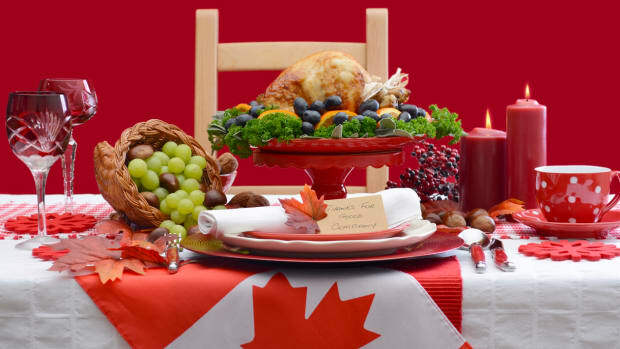 The bloodshed helped to wash away historical memory of the thanksgiving ceremonies held by both the French and Spanish settlers in the 1560s until their rediscovery in recent decades. 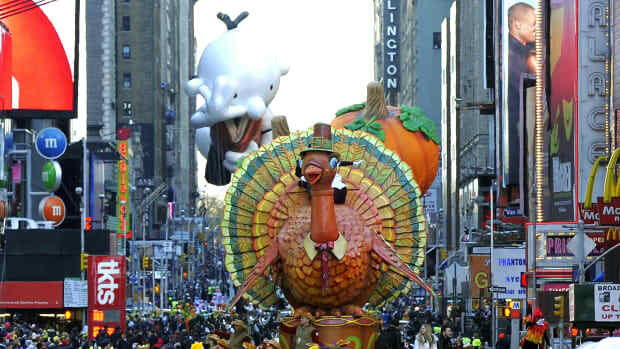 But Florida isn’t the only state that began in the 20th century to stake a claim on America’s first Thanksgiving. An historical marker erected by the Texas Society of the Daughters of the American Colonists outside Canyon, Texas, states that Father Juan de Padilla conducted a thanksgiving service there in May 1541 for an army of 1,500 accompanying Spanish conquistador Francisco Vasquez de Coronado. Virginia and Maine have also put themselves forward as hosts of the nation’s first Thanksgiving in the years before the arrival of the Mayflower. 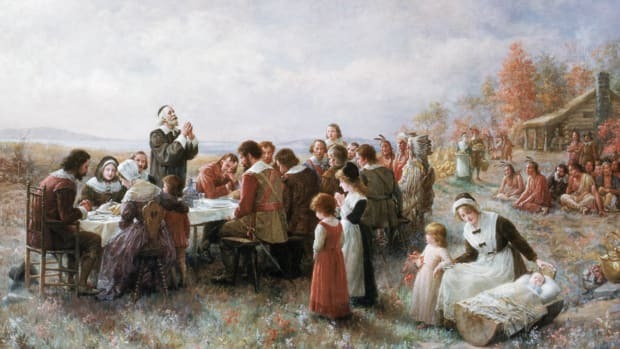 The 1621 Thanksgiving at Plymouth. 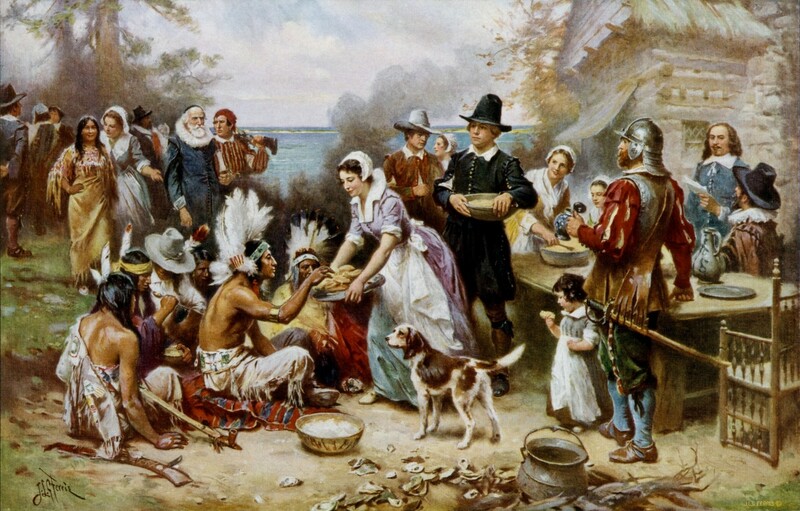 James W. Baker, author of “Thanksgiving: The Biography of an American Holiday,” notes that it was traditional for European explorers, such as Ponce de Leon upon his 1513 arrival in Florida, to give formal thanks for a safe trans-Atlantic crossing, but these isolated pre-Pilgrim ceremonies bear little connection to the future American holiday.